President Obama told CBS News he plans to ask Republican leaders "to put their [health care] ideas on the table." NEW: McConnell: Obama can start consensus "by shelving the current health spending bill"
President tells CBS News he'll "look at the Republican ideas that are out there"
Washington (CNN) -- President Obama and a bipartisan group of leaders from the Senate and the House will meet February 25 for specific talks aimed at a compromise on health care legislation, a White House official told CNN on Sunday. Those same leaders already are scheduled to go to the White House on Tuesday for broader bipartisan talks on health, the jobs bill and other topics. Tuesday's meeting will now set the table for the February 25 health talks, and it also will be the first fulfillment of the president's promise in his State of the Union address to start monthly meetings with congressional Republicans. 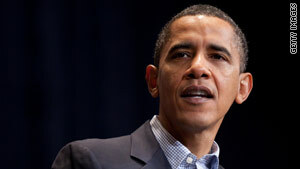 A Democratic Capitol Hill source confirmed the February 25 date for the talks. Last Thursday, Obama called for high-level talks with Republicans to work out a compromise on health care legislation, then putting the resulting bill to a vote in Congress. "If Congress decides we're not going to do it, even after all the facts are laid out, after all the options are clear, then the American people can make a judgment as to whether this Congress has done the right thing for them or not," Obama said Thursday. "That's how democracy works." Obama's comments were the first clear signal from the White House or Democrats in Congress on how they would proceed on a top legislative priority after losing their 60-seat supermajority in the Senate. Republican Scott Brown was sworn in as the new U.S. senator from Massachusetts on Thursday, leaving the Democrats one vote shy of being able to overcome GOP filibusters of health care reform and other major initiatives. In an interview Sunday with Katie Couric of CBS News, Obama said he planned to ask Republican leaders "to put their ideas on the table." "What I want to do is look at the Republican ideas that are out there and I want to be very specific," Obama said. "How do you guys want to lower costs? How do you guys intend to reform the insurance market so that people with pre-existing conditions, for example, can get health care? How do you want to make sure that the 30 million people who don't have health insurance can get it?" "If we can go step-by-step through a series of these issues and arrive at some agreements then procedurally, there's no reason why we can't do it a lot faster than the process took last year," Obama said. Leaders in both chambers and both parties reacted to Obama's remarks along party lines. Senate Minority Leader Mitch McConnell, R-Kentucky, said in a statement that while Republicans "appreciate the opportunity to share ideas with the president" to reach a bipartisan consensus, "the White House can start by shelving the current health spending bill, and with it their goal of slashing a half trillion dollars from Medicare and raising a half trillion in new taxes." "Setting these goals aside would be a sign that the administration and Democrats in Congress are listening to the country and are truly interested in a bipartisan approach," McConnell said. Senate Majority Leader Harry Reid, D-Nevada, said in a statement that Senate Democrats "have promoted the pursuit of a bipartisan approach to health reform from day one." "As we continue our work to fix our broken health care system, Senate Democrats will not relent on our commitment to protecting consumers from insurance company abuses, reducing health care costs, saving Medicare and cutting the deficit," Reid said. House Speaker Nancy Pelosi, also in a statement Sunday, said the "House-passed health insurance reform legislation included a number of Republican amendments -- added as the bill worked its way through three committees." "We remain hopeful that the Republican leadership will work in a bipartisan fashion on the great challenges the American people face," Pelosi said. House Minority Leader John Boehner, R-Ohio, said in a statement that he was "pleased that the White House finally seems interested in a real, bipartisan conversation on health care." But he added: "The problem with the Democrats' health care bills is not that the American people don't understand them; the American people do understand them, and they don't like them. The best way to start on real, bipartisan reform would be to scrap those bills and focus on the kind of step-by-step improvements that will lower health care costs and expand access." Republicans complain the comprehensive Democratic health care bills would lead to a government takeover of health care. They call for smaller steps focused on individual issues, such as limiting medical malpractice lawsuits. Democrats, however, say that spiraling health care costs that threaten the nation's future economic stability can be addressed only through comprehensive reform. Obama said Thursday that the Democratic bill that will emerge from the House-Senate talks on joining their two proposals would expand coverage to 30 million Americans who lack health insurance while reducing long-term health care costs. The measure would include an insurance exchange to allow people and small business owners to pool together to purchase coverage, Obama said, but he made no mention of a government-run public health insurance option that Republicans have rallied against. Obama said the Democratic bill would include reforms that prevent insurance companies from denying coverage for pre-existing medical conditions or capping lifetime benefits. "And by the way, all of it is paid for," Obama said. "Not only is it deficit-neutral, but the Congressional Budget Office, which is the bipartisan office that is the scorekeeper for [how much] things cost in Congress, says it is going to reduce the costs by $1 trillion." Obama called health care reform the "single best way to bring down our deficits," adding "nobody has disputed that." "Nobody can dispute the fact that if we don't tackle surging health care costs, then we can't control our budget," he said.